I have found myself both busy and distracted in the past few weeks, and as a result, I haven’t been posting (or cooking) as much as I would like. Life is like that–full of surprises, choices, decisions and turning points. I’m feeling pretty good about some decisions I’ve made lately, although they have taken my attention away from SOLE Food Kitchen for just a teeny minute. I’m trying to get back in the groove! This dish is a wonderful vegetarian creation based on the dish ratatouille, although it’s a bit messier than the neatly sliced and arranged dish. It is hearty, but not heavy and, if you use soy cheese (or no cheese), it is also a vegan dish. We served just the vegetable mix as a side dish with fish this week and served the leftovers over organic bucatini pasta–a thicker, chewier version of spaghetti. You could use any vegetables you want in this dish as long as they are fresh. 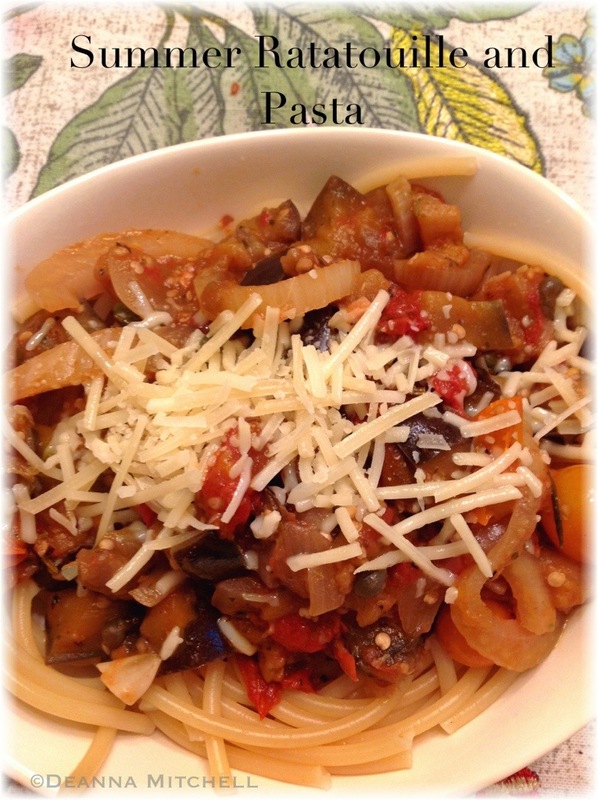 We used the traditional eggplant, tomatoes, fennel, onions and garlic. It was very good, and used up a lot of vegetables we had from our Produce Box this week. In a large sauté pan, heat the olive oil over medium low heat. Add onions and garlic. Sauté for 1-2 minutes until onions start to soften (do not let the garlic brown). Add the fennel and continue cooking another 1-2 minutes. Lower heat if necessary to keep garlic from scorching. Add the quartered tomatoes and sauté for about 3 minutes or until tomatoes start to release their juices. Add eggplant and cherry tomatoes. Season with herbs, salt and pepper. Stir well and cook over medium low heat for about 15 minutes. Add capers, stir well. Correct for seasoning, if necessary. Season boiling pasta water with a generous amount (3 tablespoons) of salt. Cook pasta according to directions (the bucatini take about 8 minutes). Drain pasta and toss with the vegetable mixture. Serve hot with a sprinkle of Parmesan or soy cheese. Important question: Where do you get your Herbs de Provence? I can never ever ever find them!!! Well, actually, I bought them in France, but Fresh Market carries them in cute little pottery jars or you could use whatever Mediterranean herbs you have. You can make your own with equal parts savory, rosemary, basil, thyme, oregano, marjoram and fennel seed. Mine has some lavender in it, too, but I don’t know if that is necessary!